As readers have told me, this book takes the prize for the ugliest cover. 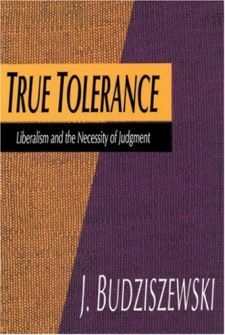 It was also the earliest statement of what has become an enduring theme of my body of work: The deep contrast between true tolerance, a genuine virtue which requires making judgments about goods and evils in order to discern which evils must be tolerated, and false tolerance, which pretends to suspend judgment about goods and evils and be "neutral." Since writing the book, I confess that I have revised my analysis of several issues concerning religion, education, and constitution interpretation (not much, eh)? On the other hand, the book includes a number of arguments which I have not presented elsewhere and still consider valid and important. Is This a Possible Constitutional Position?